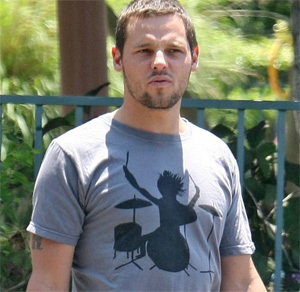 Justin Chambers was spotted at the Pilgrim School in Korea Town, Los Angeles wearing a grey t-shirt with a silhouette of a drummer going crazy with long spiky hair. Not sure who makes the drummer t-shirt but it looks very casual with the jeans and flip-flops. Justin was once a Calvin Klein model until he landed some acting roles in movies and and most recently a role in the hit TV show Grey’s Anatomy.